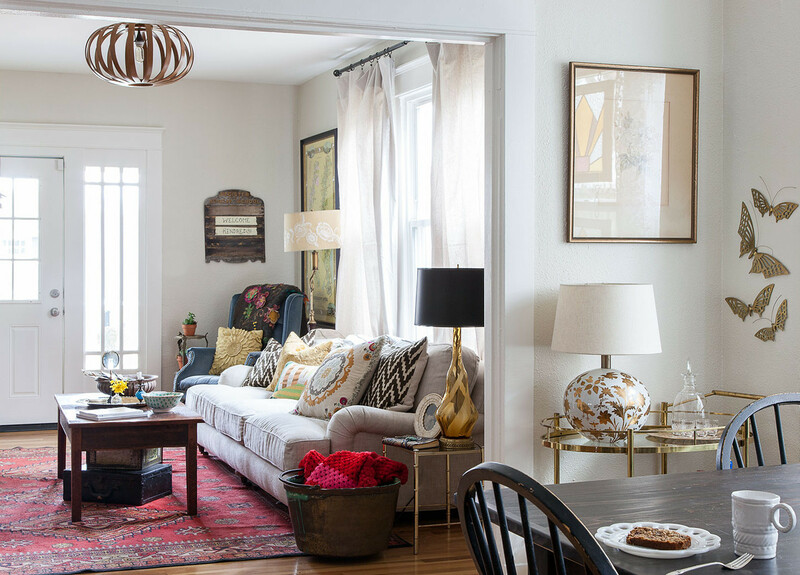 The Nashville, Tennessee, living room of Ruthie Lindsey features a spirited mix of family heirlooms and vintage finds. 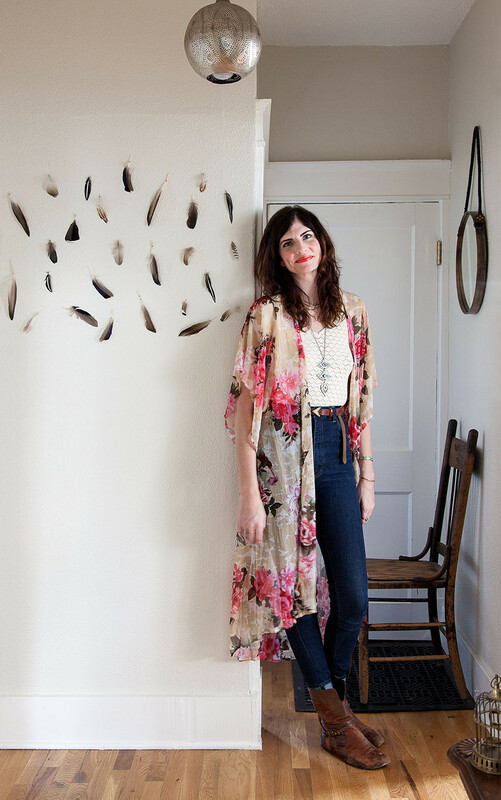 Stylist and designer Ruthie Lindsey next to a feather installation on her wall. 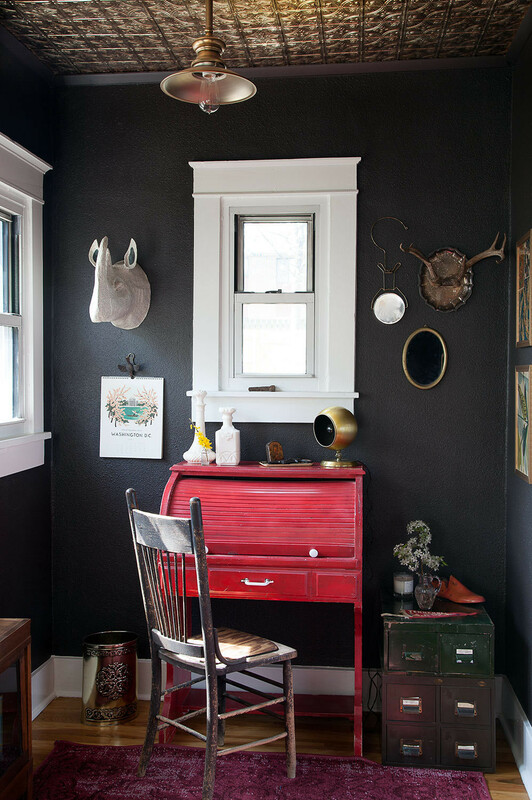 Black walls and a gold faux-pressed-tin ceiling make the tiny office a dramatic focal point. 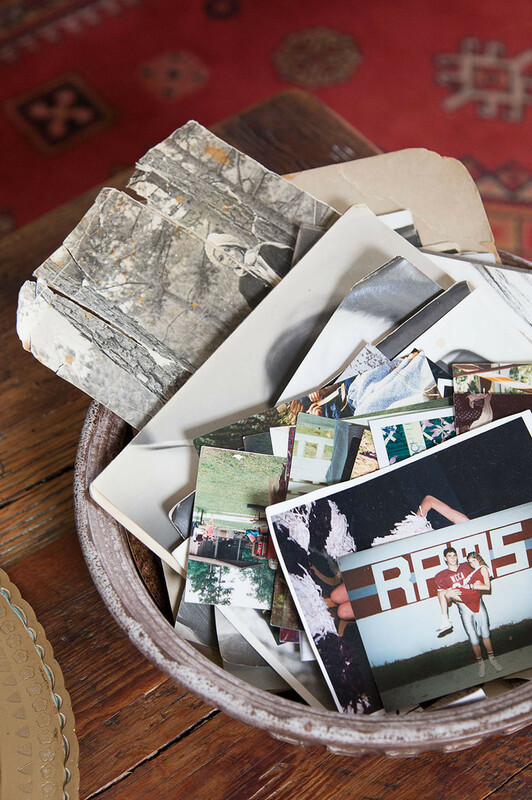 A bowl filled with sentimental photographs sits atop a coffee table Lindsey's father had made for her. A belief in the healing power of one’s surroundings has always been in Lindsey’s nature. 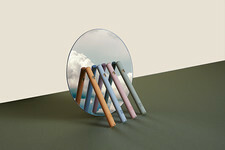 After she learned that a neck injury she incurred during a childhood car accident would require a “gnarly” surgery and keep her holed up at home, she took to prettifying the rooms as a preemptive measure against cabin fever. “When I do a space, I want it to feel good,” she says with her trademark enthusiasm. That same philosophy guides the aesthetic of her modest bungalow, which required a similarly sunny leap of faith. 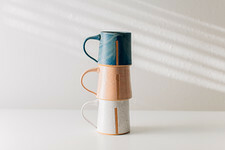 Lindsey found out about the property through a friend who lived a few houses away; when the pair sneaked over and peeked in the windows, what they saw was a sea of mauve walls, popcorn ceilings, a porch surfaced in bright-green AstroTurf—and plenty of potential. 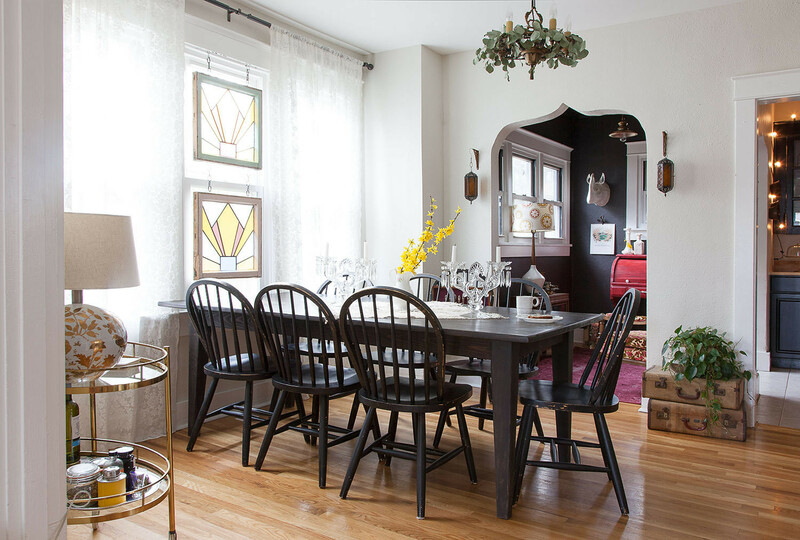 “I took a five-minute tour with a real estate agent and bought it the next day,” she says. 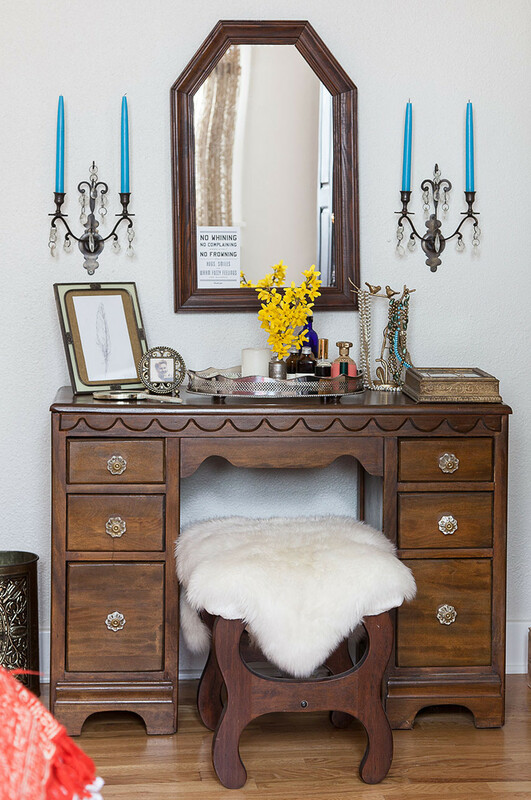 Lindsey's grandmother's vanity is one of numerous heirlooms that made the journey from Louisiana to Tennessee. 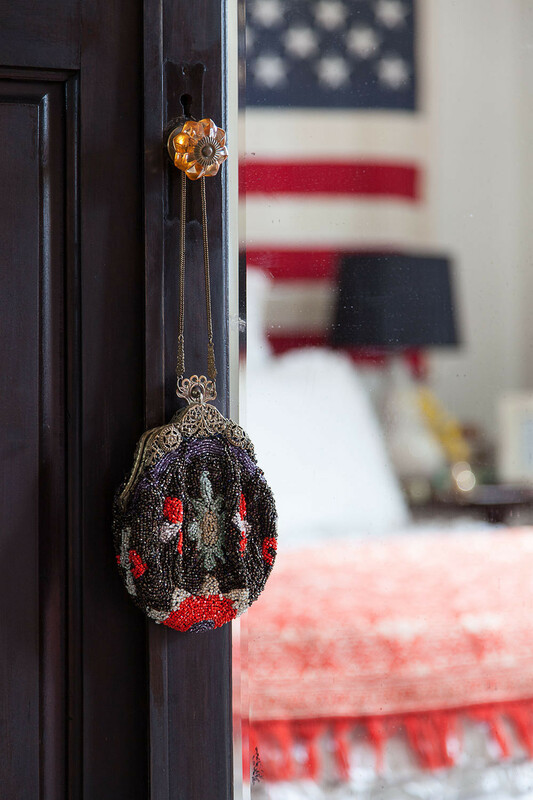 A delicate beaded handbag hangs from an amber-glass knob on the bedroom door. 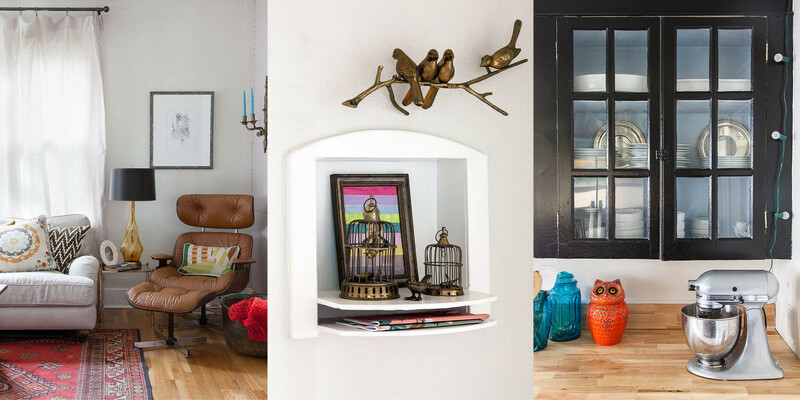 While her strict budget didn’t allow for massive renovations, Lindsey did take advantage of the skills of a few DIY-savvy friends. Together they covered the ceilings in faux-pressed-tin panels and beadboard (a more cost-effective solution than resurfacing them), replaced plastic kitchen countertops with salvaged wood, and created a built-in headboard and shelving. But when it came to decorating, she let her own history guide her. “I don’t buy things just to buy things,” she says. “In every corner of my house there are stories involved.” Her father had the coffee table in the living room made for her out of reclaimed wood from a shack in Louisiana not long before he passed away. The milk-glass collection housed in a hutch belonged to her grandmother. The refinished dining table is from her family’s farm. But the house is much more than a collection of sentimental heirlooms. Lindsey’s favorite room is also its biggest departure from the personal: the office, which with its black walls and gold ceiling exudes a sense of drama that’s heightened by a petite red roller desk and a plaster hippo trophy. A collection of gold-tone accessories—“I went through a phase where I really loved brass,” she says of her design evolution—is echoed in the adjacent dining room’s bar cart and even in a set of butterflies ascending the wall. Metallic accents and hits of black throughout are striking complements to the home's otherwise bright and cheerful aesthetic. The dining table, which is often surrounded by out-of-town guests, is another piece from Lindsey's family farm. CLOCKWISE FROM TOP LEFT Instagram images from @rolfandaughters, @baristaparlor, @mastacos, and @imogenewillie. Here's where Ruthie Lindsey sends visitors in her adopted hometown. “I don’t drink coffee, but folks who do say this is the best in town,” explains Lindsey. “I do, however eat all the food they have to offer. The sausage biscuit and homemade pop tart are something to write home about." “I’ve found so many treasures at this place,” she says of the vintage mecca. Endless furniture and country-music paraphernalia offer a glimpse into the city's past.